In the interests of highest possible security of medication, each pharmacy has its own lab which tests drug identity according to the strict guidelines of the European and Austrian Pharmacopeia. Dried-plant-product, such as chamomile for example, are also tested for identity and agent concentration. Contamination is usually detected with a microscope. Only this way constant quality can be maintained in the pharmacy. Despite the growing industrial manufacturing of drugs, the pharmacist is still producing individual medications for the patient according to doctor's recipes. Especially dermatologists, who have to take into consideration each individual skin type and condition, appreciate this valuable prescription service. Another advantage is the individual production of eye-drops under aseptic conditions, which is also carried out under strict guidelines. Since it isn't always possible to use preservatives in the eye, it is important to be able to produce perishable eye-drops just in time for the treatment. 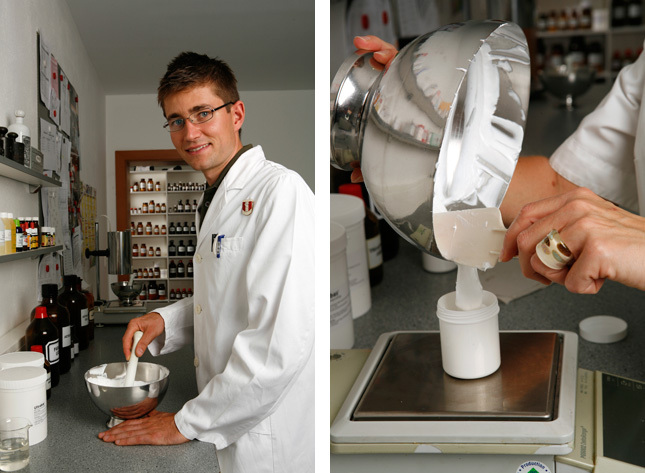 Our pharmacy also produces its own specialties - prescription-free drugs, teas, drops, ointments etc. - which are produced by the pharmacists according to his own recipes. These specialty products have proven themselves over time. Only the formulation has been modernized without losing the valuable ingredients and their properties. More about this in our section about Home Remedies.